Lovely variety of sage with green and gold variated leaves. 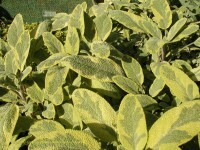 Makes a great ornamental plant in mixed border or in the herb bed to break up all the greens. Height 60cm. Full sun. Lovely in stuffings and salads. Great with pickles and cheese.